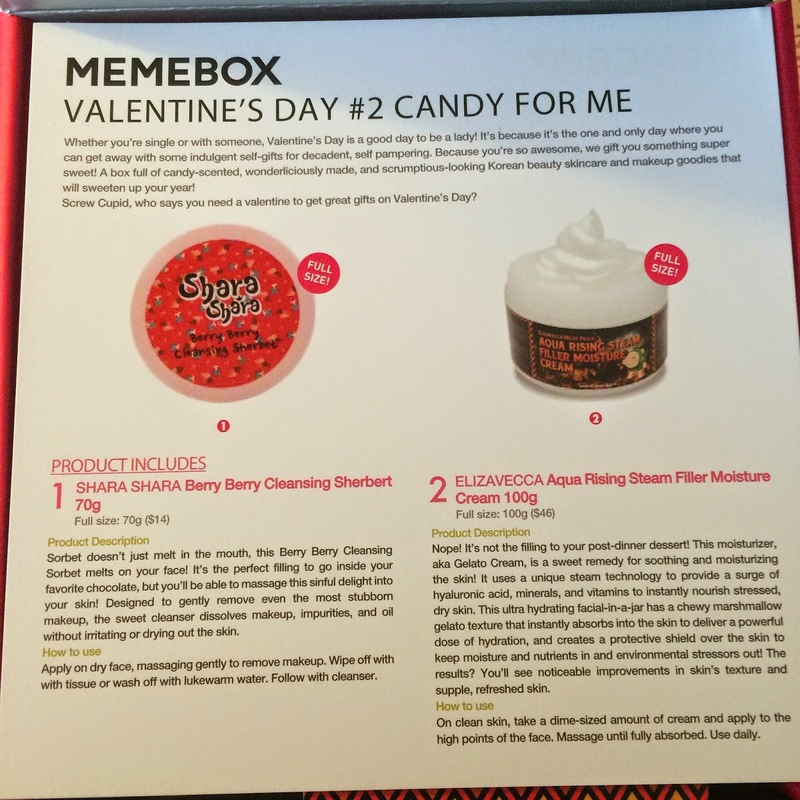 "Valentine's Day Box #2: Candy For Me" was part of a trio of boxes that become the last international boxes available from Memebox. I ordered all three in the hopes that they would be something special and reminiscent of the thoughtful and well collaborated boxes that first drew me into Memebox. In this post, we'll take a look at the contents of the Candy For Me box and what I think it looks like as a whole. Whether you're single or with someone, Valentine's Day is a good day to be a lady! It's because it's the one and only day where you can get away with some indulgent self-gifts for decadent, self pampering. Because you're so awesome, we gift you something super sweet! A box full of candy-scented, wonderliciously made, and scrumptious-looking Korean beauty skincare and makeup goodies tat will sweeten up your year! Screw Cupid, who says you need a valentine to get great gifts on Valentine's Day? Sorbet doesn't just melt in the mouth, this Berry Berry Cleansing Sorbet melts on your face! It's the perfect filling to go inside your favorite chocolate, but you'll be able to massage this sinful delight into your skin! Designed to gently remove even the most stubborn makeup, the sweet cleanser dissolves makeup, impurities, and oil without irritating or drying out the skin. How To Use: Apply on dry face, massaging gently to remove makeup. Wipe off with tissue or wash off with lukewarm water. Follow with cleanser. This cleansing balm smells like sweet, delicious, berry-infused heaven. It has a soft pink color that reminds me of taffy when I see it in the jar (I don't know why, that's just what comes to mind), but the smell - I may not even use this, I might just carry the jar around with me forever so I can always smell it! Oil cleansers make me nervous since certain oils can cause acne, and with already acne-prone skin I don't like to take too many chances. After looking further into the ingredients I found very little cause for concern, especially since this is like a pre-cleanser, and I will be using another cleanser afterwards to remove any residue (cosdna analysis of this item can be read here). Nope! It's not the filling to your post-dinner dessert! This moisturizer, aka Gelato Cream, is a sweet remedy for soothing and moisturizing the skin! It uses a unique steam technology to provide a surge of hyaluronic acid, minerals, and vitamins to instantly nourish stressed, dry skin. This ultra hydrating facial-in-a-jar has a chewy marshmallow gelato texture that instantly absorbs into the skin to deliver a powerful dose of hydration, and creates a protective shield over the skin to keep moisture and nutrients in and environmental stressors out! The results? You'll see noticeable improvements in skin's texture and supple, refreshed skin. How To Use: On clean skin, take a dime-sized amount of cream and apply to the high points of the face. Massage until fully absorbed. Use daily. These unique facial sheet masks contain sweet and savory pomegranate, and Cleopatra's secret to her legendary beauty, hibiscus flower extract. The micro-fiber material is saturated with a blend of sweet ingredients to help diminish wrinkles and fine lines and maximize brightness and evenness in the complexion for a youthful look all around. The intense formula delivers radiant results instantly, while reducing existing pigmentation for a breathtakingly beautiful finish. Who knew such candy-sweet ingredients will give you your radiant glow? How To Use: On clean skin, unfold facial sheet mask and place over the face. Leave on for 15 to 20 minutes. Remove. Gently pat remaining serum into the skin. Do not rinse. This mask is full of moisturizing ingredients, but nothing is really coming up on the ingredients list that is for brightening/lightening. I have oily skin year-round, so I'm not sure yet if I'll try these out or pass them along to someone with dry skin (you can view the cosdna analysis here). Brighten and perfect your complexion with this sweet and refreshing kiwi and yogurt twist! Kiwi and yogurt flavors are extremely popular candy flavors in Korea, and can be easily found in candy baskets and gift boxes during the Valentine's season in Korea. Now, take the sweet mix, infused with real kiwi extracts, yogurt, hyaluronic acid and vitamin e to brighten, correct, hydrate, and firm saggy skin for your best skin ever! How To Use: Open one packet of Kiwi Brightening Yogurt Mask Pack. On cleansed face, take entire contents of the massage mask and spread evenly over the entire face. Leave on for 5 to 10 minutes. Rinse with lukewarm water. 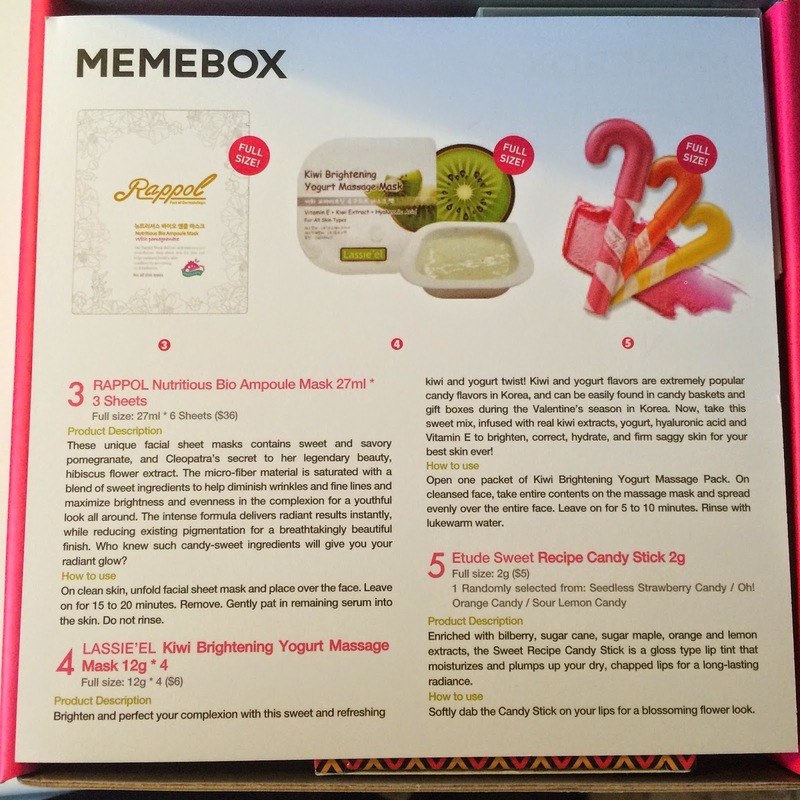 I've been dying to try these masks since Fanserviced posted the yogurt-y goodness of the Raspberry mask from the Winter Essential Masks Memebox. They are creamy, and soothing, with minimal acne triggers - and since your skin is rinsed after use my skin hopefully will not react to these minimal irritants (you can view the cosdna analysis here). Enriched with bilberry, sugar cane, sugar maple, orange and lemon extracts, the Sweet Recipe Candy Stick is a gloss type lip tint that moisturizes and plumps up your dry, chapped lips for a long-lasting radiance. How To Use: Softly dab the Candy Stick on your lips for a blossoming flower look. I received the "Oh! Orange Candy" stick in this box. I received the same one in a past box, and I have to admit that I was less than thrilled with it. While it provided a nice subtle tint and felt creamy and looked glossy upon initial application, after a while I felt like it dried out my lips to some extent and made them more chapped than they were before-hand. I experienced this every time I used the lip balm and eventually tossed it because I simply didn't like it. This one will be passed along to someone else.